December saw small price rises at most New Zealand ports driven by some lowering of ocean freight rates against steady in-market prices and demand in Asia. The announced (probably) reduction in Russian export log tariffs to China had surprisingly little impact on market sentiment (see section below); level of enquiry from new Chinese purchasers remains high. The Chinese New Year (early February) is expected to cause some disruption to the market and possibly downward pressure on price and demand. Beyond that, the greatest risk in the China market appears to be high inflation and an over-heated and speculative property market. New Zealand's alternative major markets of Japan and Korea remain steady. India has good demand but is suffering from long discharge delays making shipping expensive. Continued concern about scarcity and increasing production cost of logs from traditional sources such as Russia, Nth America and SE Asian. Continued significant trend of switching to Radiata pine from New Zealand. Currently the annualised harvest in Russia is down by 35% and log exports down by 60%. Many smaller logging companies have disappeared or been bought up by large companies. Log supply from Russia into China has declined from a peak of 25 million m³ in 2007 to 15 million m³ in 2009. There is doubt as to whether supply from Russia will grow again much beyond the current levels. Reduced availability/higher price of tropical hardwoods is assisting Radiata clears to gain market share. Strong economic growth rate, rapid urbanisation and related massive infrastructure spend. Low debt levels and high current account surplus and foreign exchange reserves. Low labour rates and highly competitive manufacturing sector. In the past 10 years the value of China's furniture production has increased from USD15 billion to USD105 billion. China's total wood demand is forecast to increase from 250 million m³ in 2010 to over 350 million m³ in 2015. The additional 100+ million m³ demand will have to come principally from imports of logs and lumber. Pacific Rim countries (including NZ) will be major beneficiaries of the increasing demand for wood from China. The huge, 10+ year-long pine beetle salvage programme in British Columbia is coming to an end, reducing the volumes of logs and lumber coming out of the region (and ending up in China). It is estimated one billion m³ of BC timber has been killed by the pine beetle which has been described as one of North America's largest environmental disasters. An eventual turn-around in the US property and construction market (which could commence in 2011) will draw volume away from log and lumber exports to China. Imported lumber from British Columbia and Chile is highly competitive. Continued rapid increases in market share of Nth American logs and lumber. The recent announcement by Russia that it will be phasing out the Russian log export tax to Europe and the expectation this will extend to China log exports as well. Massive speculation in the property market and high but under-reported inflation which may require draconian and damaging intervention. The IMF reporting that home prices in Shenzen, Shanghai, Beijing and Nanjing seem "increasingly disconnected from fundamentals". Land sales making up a high proportion of local government revenues, disguising an erosion in state finances (and a conflict of interest in taming rampant property inflation). Relatively closed banking system and prospect of high, undisclosed, levels of bad debt. Only 30% of GDP is attributable to domestic consumption (60% in developed countries) – China is artificially holding currency down to boost exports, adding fuel to the inflation pressures and making China vulnerable to a downturn in exports/revaluation of currency. Radiata's competitiveness is finely price-balanced. If the discount for NZ Radiata logs gets less than about USD10/m³ in China, Russian and Nth American logs are favoured due to their higher quality. This unexpected announcement of probable reductions in Russia's log export tariff, with potentially detrimental impacts on NZ's burgeoning log trade with China, has had a distinctly "ho hum" reaction. This is partly due to the lack of detail around the announcement which was first released in late November 2010. In a bid to join the World Trade Organisation (WTO), Russia has signalled that it is prepared to reduce its current 25% log export tariff. This is in stark contrast to the prior position that is was intending (at some continually deferred point in the future) to increase the softwood tariff to a minimum €50/m³ or 80%. The intention of the log export tariff was to attract foreign investors in Russia's timber processing industry. And to some extent this has been successful, with a big increase in wood processing investment by Chinese, in areas just inland from the China/Russia border. Russia is the only major economy that doesn't belong to the WTO. Joining requires consent from all 153 members of the Geneva-based body. It is believed that whilst Russia appears to have been trying to join the WTO for nearly two decades, its resolve has been mixed since membership could lead Russia to lose more than it gains. For example, membership could force Moscow to cut import tariffs on many goods, exposing its (largely) uncompetitive manufacturing base to foreign competition. Russia finds something to smile about but what will it mean for NZ forest owners? 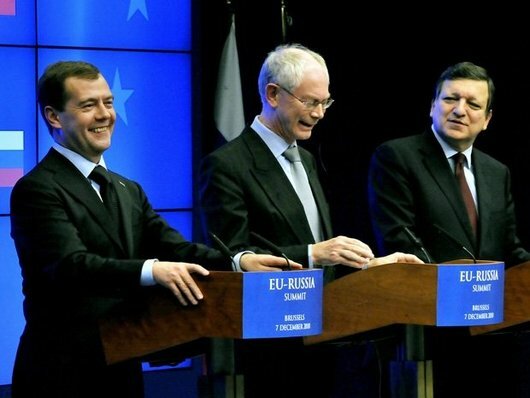 Russian President Dimitry Medvedev (L) at a joint press conference with European Union President Herman Van Rompuy (C) and European Commission Chairman Jose Mauel Barroso (R). For Russia to be accepted in the WTO, it must eliminate any disputes with other WTO members, such Finland that has vigorously opposed the log export tariffs and, potentially, China, if the proposed log export tax reductions in the EU are not also applied to China. However, at this stage it is unclear "when", or by "how much", or "to whom", any tariffs reductions will apply, and this is keeping the market guessing. There are also other potential admission requirements which could delay Russia joining the WTO, such as cancelling state-aid programmes, unfair health rules for farm imports and weak enforcement of intellectual property rights. The speed of progress of Russian qualifying for entry into the WTO and the substance of the log export tariff reductions. The ability for Russian to gear up its harvesting capacity. How much of the increased volume gets diverted to Europe (principally Scandinavia and the Baltic states). China's ability to continue its stellar growth rates in which case a yawning log deficit will readily accommodate increase volumes from Russia with little impact on demand from other sources such as New Zealand. Rates have continued to fall and some are being reported below USD40/JAS m³ for the first time this year although there were some higher rate "pinch-points" for late fixtures prior to Christmas which is usual. Ocean freight rates to India have stayed persistently high due to discharge delays at the Indian ports. Despite a small rise in the Baltic Handysize index recently, it remains 40% below its value six months ago. This year has been a very good year for the world's producers of market pulp. World production for the first eight months was eight percent higher than last year. Lumber markets were mixed around the world. In Sweden and Finland, lumber prices trended downward during the first half of 2010. Canadian west coast spruce-pine-fir prices went up the most, and were 14 percent higher in September than in June. The closures, mothballing and capacity reduction at three sawmills resulting in the loss of some 130 jobs dominated the news recently and, as noted by Peter Clark, PF Olsen's CEO, illustrates just how vulnerable our wood processing market is. Conditions have deteriorated a little in Australia (New Zealand's most important market for processed forest products) with URS reporting a drop in financing and dwelling approvals in the September 2010 quarter. The government first home buyer's grants ceased during this period while the positive effects of government social housing initiatives appear to have subsided. The fall in the NZD/AUD cross rate to a ten-year low recently will cushion a weakening Australian market, but is will also help other forest products importers in competition to New Zealand.